This entry was posted in aluminum fencing, comparisons to vinyl fencing, custom fence options, metal fences, Wholesale Aluminum Fencing and tagged aluminum fence, Aluminum fences, aluminum gates, aluminum pool fence, Backyard Fencing, metal pool fence, Metal Pool Fences, pool fences, Residential Aluminum Fences, residential fencing, wholesale aluminum fencing on October 26, 2017 by admin. This entry was posted in Aluminum Deck Railing, aluminum fencing, Aluminum Gates, comparisons to vinyl fencing, Driveway Gates, metal fences, Wholesale Aluminum Fencing and tagged aluminum driveway gates, aluminum fence, Aluminum fences, aluminum fencing, aluminum pool fencing, aluminum pool gates, aluminum swimming pool fence, metal pool fence, residential fencing, wholesale aluminum fencing on May 31, 2017 by admin. When choosing a fence for your yard there are many materials you can choose from. Two popular options include: vinyl and aluminum. As homeowners look into the pros and cons of both, they will be able to determine what the best material in fencing for their needs. The first step homeowners should take is to determine what they want and need from the installation of a new fence. Create a list of priorities that can be used when scrolling through the pros and cons included in this article. Homeowners need to choose the material that best fits the perimeter of the property based on the following characteristics: strength, price, maintenance, beauty and seclusion. 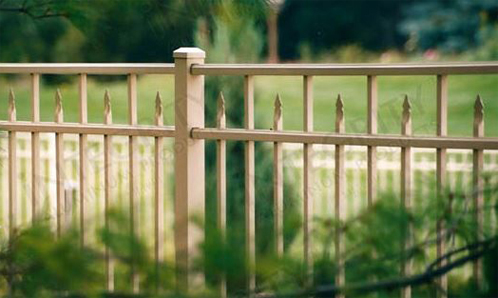 Strength: Aluminum fencing is superior in strength to that of vinyl. There are a variety of grades to choose from when purchasing wholesale aluminum fencing from residential grade and pool grade up to commercial and industrial grade. Depending on what the fence is going to be used for will decide for you what grade of aluminum fencing to purchase. Price: When it comes to picking out fencing based on the price there isn’t a clear winner. Not only must homeowners consider the cost of the fence and the installation, they must also factor in the expense to maintain the fence. The difference overall between aluminum and vinyl is minimal and therefore is not really a major factor to consider overall. Maintenance: Both materials, aluminum and vinyl, are pretty low key to maintain. Both fencing materials do not require yearly treatment, staining or painting. A yearly spray down with the garden hose to wash off any dirt build up is all you will need to keep both types of fencing looking as good as new. Installation: Both vinyl and aluminum fence panels are simple to install. Aluminum wins when it comes to a yard with a slope or grade to it. Aluminum fencing offers an ease of rack ability that does not easily happen with vinyl. Both are easily installed in a weekend and fit together like a puzzle. Beauty: The look of vinyl is completely different than that of aluminum. The styles they offer are on two ends of the spectrum. Depending on the exterior look and feel of your home and landscape will determine where you stand on choosing between vinyl and wholesale aluminum fencing. Both come in a variety of styles and colors to choose from ranging from modern to classic to everything in between. Seclusion: When it comes to privacy fencing aluminum vinyl may be a better material to suit your needs. If you have a spying neighbor or a need to hide the neighbor’s unattractive landscape you will want a solid fence which you will find in vinyl. Aluminum has an eye catching appeal but if you are looking for backyard seclusion vinyl is a better choice. Now it is time for you to be the judge. What material best suits what you are looking for out a fence. Both offer strong, resilient, stylish, affordable options in fencing that suit the many needs homeowners have when looking for pool or perimeter fencing. This entry was posted in aluminum fencing, comparisons to vinyl fencing, custom fence options, metal fences, pet containment, pool safety, Wholesale Aluminum Fencing and tagged aluminum driveway gates, aluminum fence, Aluminum fences, aluminum fencing, aluminum pool fencing, aluminum pool gates, aluminum swimming pool fence, metal pool fence, residential fencing, wholesale aluminum fencing on December 28, 2015 by admin. The view is better with aluminum fences! This entry was posted in aluminum fencing, comparisons to vinyl fencing on November 12, 2011 by admin.